The IonGen System is an electronic water clarifier for use in ponds and pondless waterfalls. It is completely safe for fish and plants, and is not toxic to any animals that may drink from the water feature. 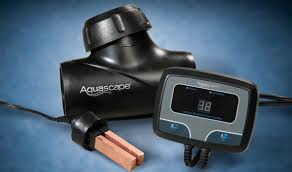 The IonGen automatic control panel sends a signal to a copper probe that rests in the water. The dissolved copper works on controlling the algae and increasing water clarity. An easy to use touchpad provides a simple method for adjusting the amount of ionization and an electronic indicator automatically signals when the probe needs replacing. Forget adding the chemicals and algaecides. It’s easy to set up and easy to maintain. Come by our shop to see the IonGen in action. We’ve installed this wonderful clarifier on our big display pond and the water has never looked better.